What does it mean “to tango?” Well, this metaphor can be seen in a good and a bad way. Technically speaking, the tango involves a variety of moves made by two partners. Sometimes, the moves may be in tandem – other times, they may be moving in the complete opposite direction. Like when couples brawl, make up, fight again, someone sleeps on the couch, and then they get together again. This dance is tense – but at the same time, it makes you wonder: what will happen next? Since the first world wars, there were several tangos. Russia fought together with the Allies of World War I, making a team with the United States in their fight against Germany. In World War II, Russia once more fought alongside the United States – pushing back the Axis force. During the Cold War, their tango started taking yet another direction. Russia and the United States were making different, opposite moves – this time, one against another. But this is also where the tango took a third “person” – namely, China. At first, China danced with the United States – leaving Russia to watch their tandem dance. They were all in synch – until China started going through a civil revolution of their own. Russia started doing the “opposite” tango again with the United States. A new republic was founded in China – and the country started to dance again. This time, however, it was Russia who stepped in. After China and Russia have formed an alliance, they were going after the United States with new forces. It was a “teasing” dance, where everyone showed off their moves – although there were also several “jumps” that made the war into a violent one. The dance was long – and the moves were very complicated. The “dancers” became tired, and they decided that the dance should come to an end. This is when a summit was called to sign a truce. For now, the world should be at peace – at least, for a little while. 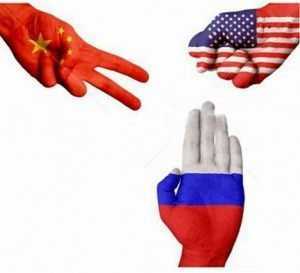 Once more, these three powers show that the tango is not the same just with two “people” – and Russia, China, and the United States once more began to dance. Russia had its presidential election in 2018, China had its 19th Party Congress, and Trump was beginning his second year as president. This, obviously, paved the way for new relations between the nations. Vladimir Putin and Xi Jimping already had a close personal relationship – which means that they would dance in tandem at this point. They would do joint military exercises, energy agreements, and joint economic development to make both nations grow stronger. At this point, you could say that the US moves make Russia and China dance much better together. The new trading taxes from China to the United States put China at an economical pressure – creating more common ground with Russia this way. The fact that US warships keep sailing through the South Sea of China doesn’t make things any easier. At this point, however, Trump is at least trying to restore relations with Russia. When the two presidents met at Helsinki, they alluded to the possibility of an alliance. Talking about the past collaborations between the countries, they agreed that two nations with great military power should not be in conflict with each other – but in alliance with each other. There are, however, people that believe this to be unlikely. During a discussion at Carnegie-Ttsinghua Center, several scholars discussed the future of the nations – as well as the future between them. They believed that Russia would always try to aim higher – with Putin mainly focusing on making Russia a leading power. While still trying to maintain a peaceful line, Russia and the United States are still in a rather tense relationship. In the meantime, the relationship between China and Russia is getting stronger. While China may still fear the implication of an alliance, the fact that the United States is stepping on both their tails is actually pushing the two states closer and closer. This is just as a tango should be: several moves in tandem, others in opposition. Each move is a consequent of the other – which will reach to the final dance. At this point, we can’t say for sure how their tango will end. China and Russia are in synch, and they are getting better. The United States is trying – but it still trips every now and again. What we do know is that every dancer is at least trying not to step too much on the other one’s toes.